Our most popular line of wood wine racks! You can't beat the price and ease of installation of our Modular Wine Racks. The all heart redwood racks for wine are available in two different heights which can be stacked to suit a variety of ceiling heights. We can customize this wine racking to suit your cellar. A customized wine cellar at a modular racking price! F01A option of the modular wine rack measures 32"H x 32"W and the F01B option of the modular wine rack measures 48"H x 32"W.
F02A modular wine rack option measures 32"H x 16"W and F02B modular wine rack option measures 48"H x 16"W.
F03A modular wine rack option measures 32"H x 16"W and the F03B modular wine rack option measures 48"H x 16"W. This wood wine rack is perfect for half bottles / 375mL. Curved corner wine rack option F04A measures 32"H x 19½"W and option F04B measures 48"H x 19½"W.
The Bordeaux Bin/Cardboard Case modular wine rack is available with option F06A which measures 32"H x 16"W and F06B measures 48"H x 16"W.
Wine racking for Champagne/Magnum bottles with options F08A which measure 32"H x 16"W and F08B measures 48"H x 16"W.
Wood case racks that fits a 12 bottle bordeaux case. 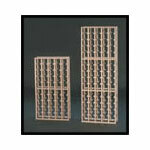 Wine rack options F09A measures 32"H x 24"W and F09 measures 48"H x 24"W.